Mataika Tuicakau, was born in Tovu, Totoya, Lau. 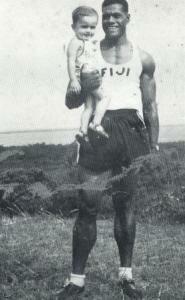 He was a big affable athlete whose greatest exploits brought world attention to tiny Fiji. It was at the British Empire Games in Auckland in 1950 that Mataika Tuicakau won a gold medal in the shot put event when he projected the leaden ball a distance of 48 feet and and 1/4 inches. That alone was not enough for this fine sportsman. He was acclaim for himself and for Fiji, when he simply could not contain himself in achieving this remarkable victory; he mounted the victory dais long before the official medal presentation was announced. Mataika Tuicakau capped off that fine gold medal winning performance by capturing the silver medal in the discus event at the same Games, with a dine hurl of 144 feet 4 1/2 inches. The Fiji shot out record he set during the Suva National Championships in April 1951 still stands at the time of his induction.